Well, March has started in like the traditional lion, windy wet and cold for many of us but a visit to the Erdington Cycle Jumble turned out two Major Nichols for sale, an early 60’s road track Nervex Pro refinished and with the short hyphenated punched numbers seen on a couple of other frames, the recent Cliff Peters and Ian’s Wilson. 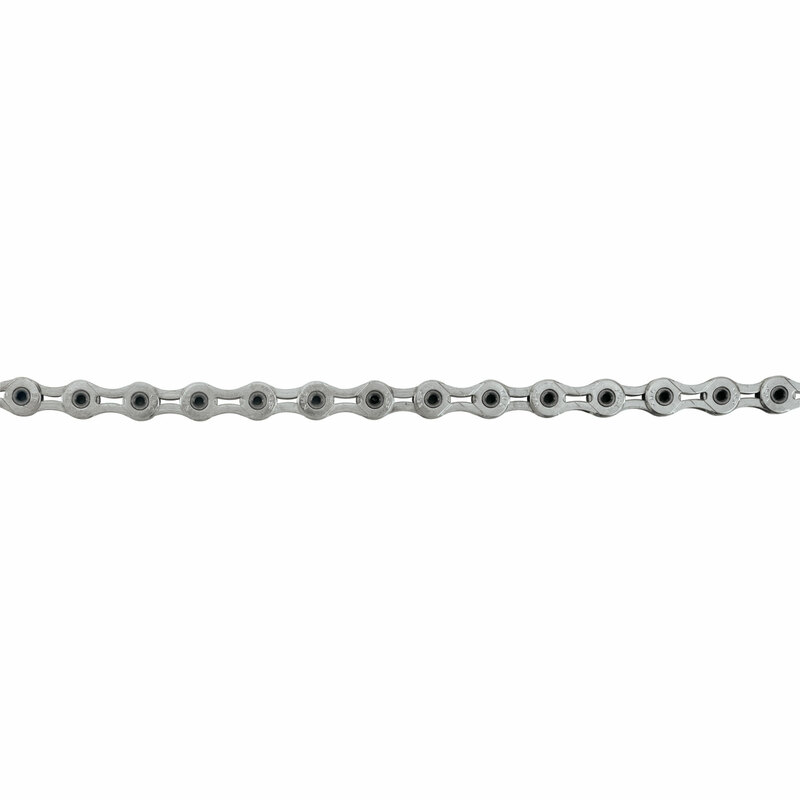 Probably one sold through an agent to order as it has vertical dropouts only seen on one other frame built for Wilson. Not much doubt about the builder and with some provenance. The second was a later Nervex Pro from the 1980’s in need of TLC and a refinish. The bonus was a chat to a guy with three others which I have to write up. Well, at least the traditional ‘February Fill Dike’ of William Barton’s famous poem hasn’t fully arrived and there are promises of better things to come. Not least of these is Alvin’s Annual Anniversary Major Nichols Ride and here are the full details. In addition we have an enthusiast’s late 25” MN 8915 for sale from her long term owner who has had to give up riding. If you are interested you can contact him by dropping the website a message and I will give you contact details. Here are some photos to tempt your interest. A Happy New Year to all from James, Alvin and myself. Thanks to those who have helped with advice and information and to owners who cherish their Major Nichols machines and take the trouble to contact us. Some dates for the diary. 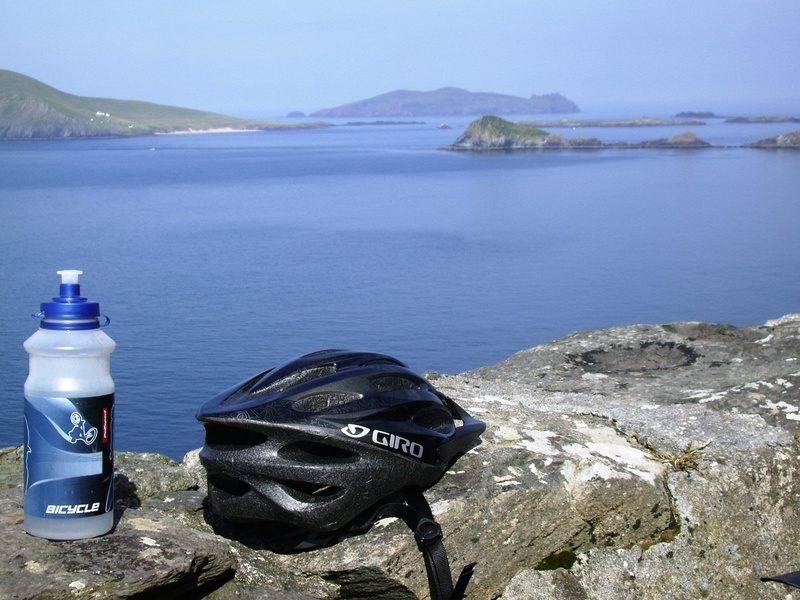 There will be two formal MN rides this year on Sunday 5th May and one on Saturday 30th August or Sunday 1st September. 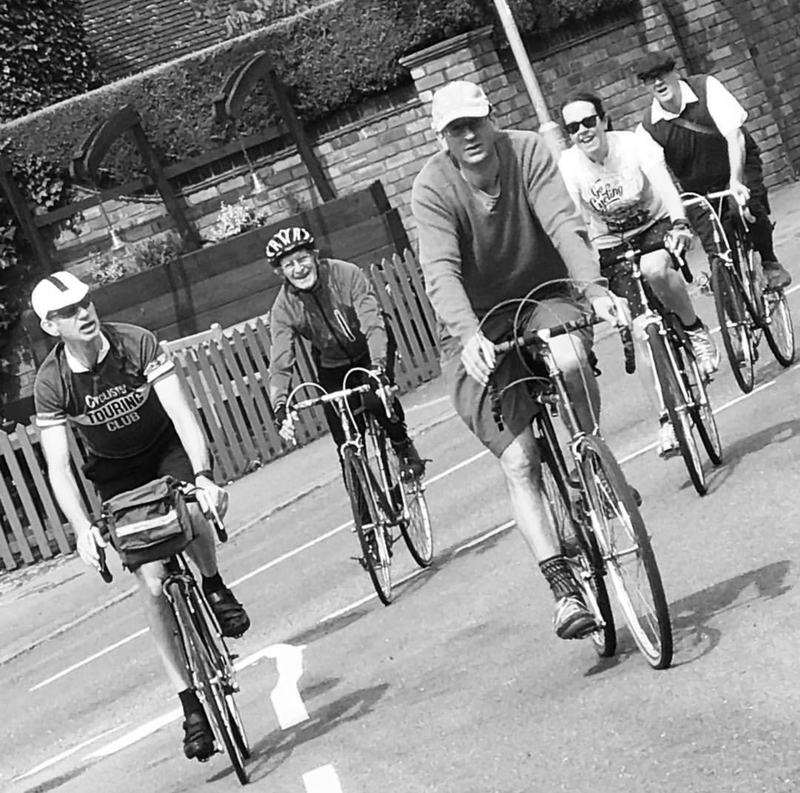 If you are looking for something more challenging you could try the classic friendly Ride Lichfield sportive on 23rd June (same day as Walsall Roads 100 year anniversary ride). Just 150 places but free (or for a donation). Details and booking can be found here. I have finally got round to thinking again about this website and the need to keep it active. The years worries have begun to recede a little and God willing will be diminishing further next spring. Through the year I have gleaned a surprising number of Major’s frames and bikes thanks in particular to Pinkerton Restorations, Golden Age Cycles, Ebay sellers and through the kind individuals who have contacted me through the website or closed group. Please keep them coming! They have all the usual varieties from clubman to top of the range customs in a wide range of sizes and conditions and hopefully James will add a couple in the new year while I try to get back on the road as it were. There are some stunners and some beauties amongst the years haul including one of the most personalised since Big Yellow from America’s west coast in the beginnings of the site. Next year will again have two formal MN rides, as usual now, one in early May and one in early September. Details will appear here and in the MN Closed Facebook group when they are known. 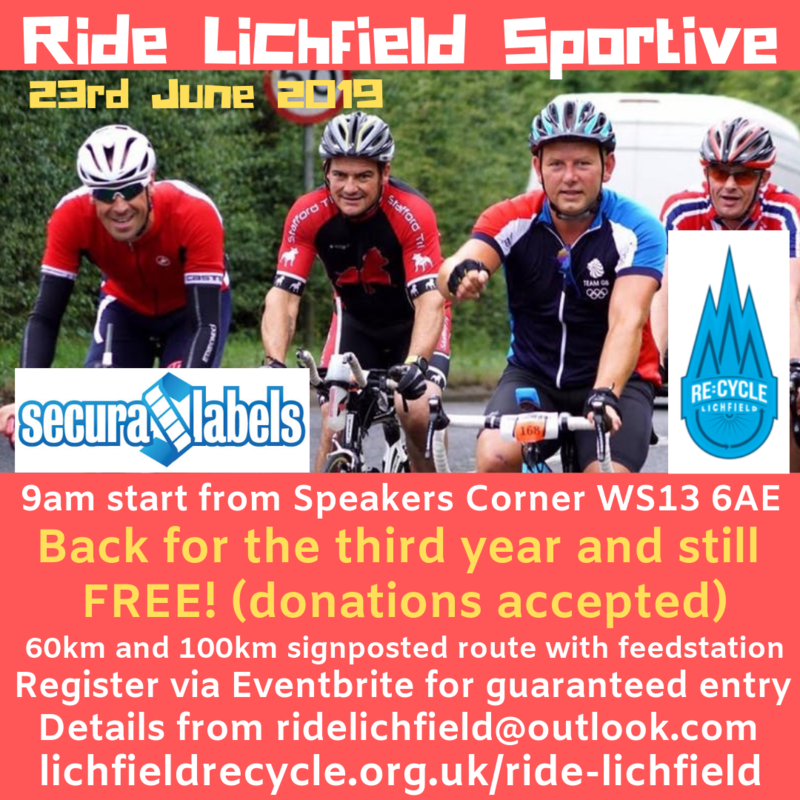 In June 2019. the project James and I are associated with, Lichfield Re:Cycle, will be holding a cycling festival and sportive again where a classic element would be most welcome over the 60 or 100 mile route. There will also be social rides during the year. Details of that will be found here too, in good time. Best wishes for the coming season and year ahead. After ‘Flaming June’ we seem to be on a continuing path and be thankful of some good weather to get out and ride. Don’t forget there will be an opportunity to ride your MN or West Midlands bike on Sunday 2nd of September at Lichfield. The route has not been determined yet, but even if it turns out to be the same as last year, there will be a good predominately easy route, mainly on country lanes. If I can agree a lunch stop closer to the city, a shorter after lunch return option can be planned for our much valued and less able ageing primates. The start will be as usual in the historic City in sight of the cathedral and you can consider a day out for your family to enjoy the park and its facilities or to take a short walk to explore the old city, the cathedral and picturesque Stowe Pool. Use this as your excuse to ride perhaps? It has been a Flaming June start for me in Ireland with fantastic weather and no incentive to sit and write. So here is a slightly late effort. 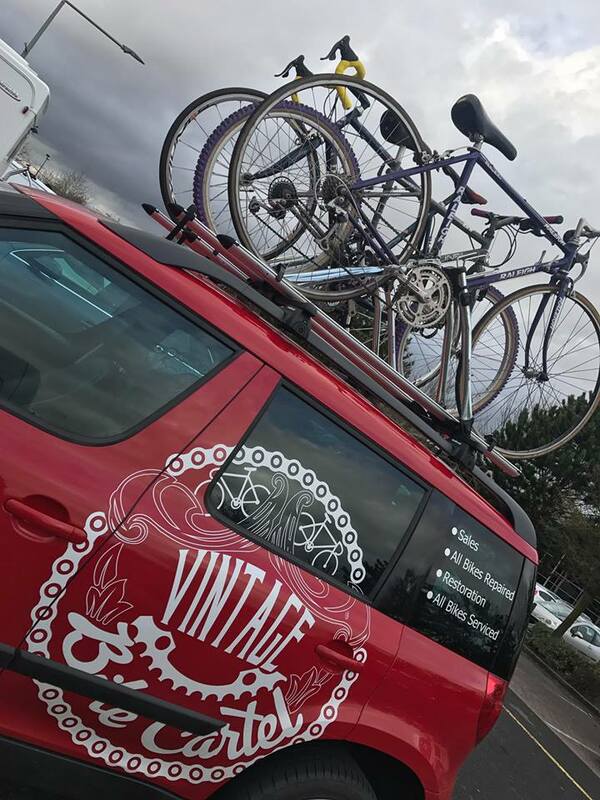 After the May ride (more photos can be seen here) there are opportunities to ride your MN machines, especially the free Ride Lichfield sportive on July 1st where there is a classics entry. Email ridelichfield@outlook.com to confirm your free entry. 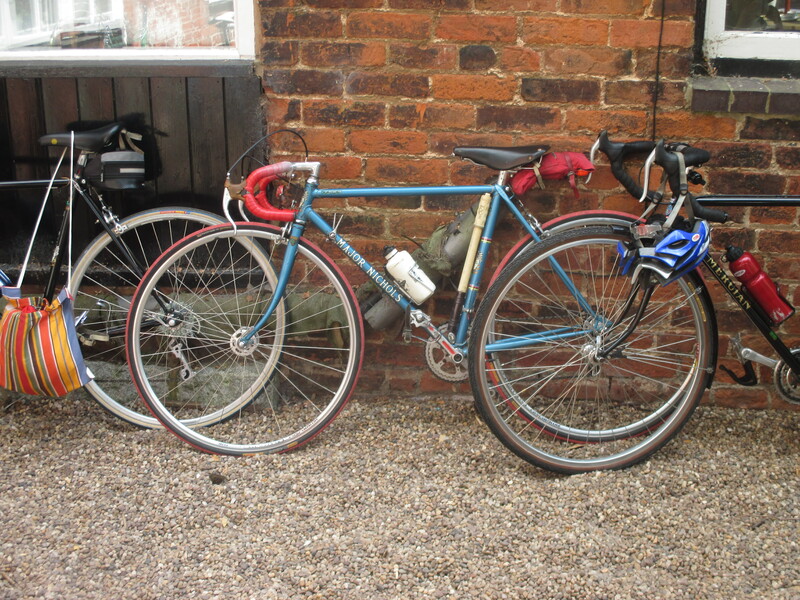 A late summer MN/classic lightweights/Brummy bikes social ride takes place on 2nd September in Lichfield. I have a batch of bikes to write up, but now one stands out as an opportunity and I have to write it! This is a Major Nichols built Italia sold through Wilsons of Birmingham in their colours. Fantastic original Major Nichols finish and the owner says ‘Rides better than my RRS’. It will be on the site very shortly and the price for this Campagnolo driven machine is an absolute bargain at £350. Finally, here is a picture of my star of the May ride, now beautifully conserved and refitted with a Campagnolo drive train and period wheels, MN 65-4-9. What a glamorous piece of MN advertisement! Just to remind you that the MN Anniversary Ride is on Saturday 5th May at Rowberry’s Garden Centre, Chaddesley Corbett from 10am with a 10.30am sign in and an 11.00am start. More details are in the April editorial below. 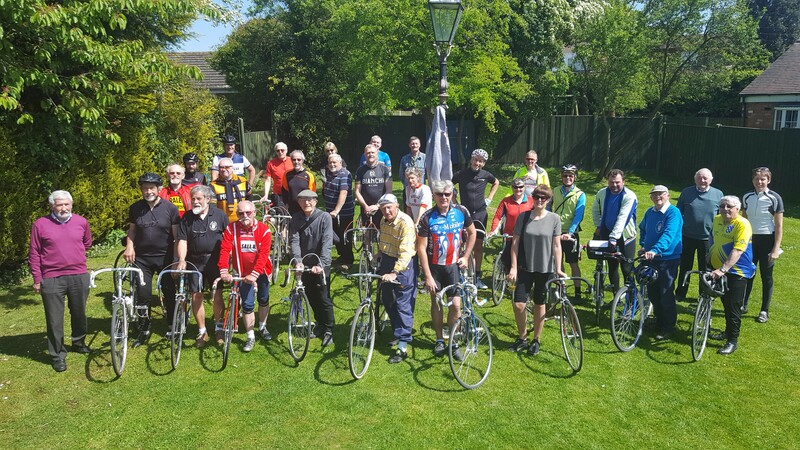 Lichfield Re:Cycle held their first Classic and Lightweights social ride on April 22nd (photo above) and will hold a sportive on 1st July with a classic entry and also the Absent Friends ride later in the year on 2nd September. The first ride last week had two MN bikes turn out. These are free events and are supported by The Vintage Bike Cartel. Photos and accounts of previous years rides can be seen here. We hope some of you will already have put the Ride Lichfield cycle festival in your diary with a highlight being the sportive on 1st July where there will be a Classics entry. See the posters below for details of that and a spring ride on 22nd April from Lichfield, including an email contact to register interest for both. A further ride later in the year will now incorporate our established Absent Friends/late summer MN ride on 2nd September. If anybody would like advice on overnight accommodation we would be happy to help. Of course there is the MN ride again in May as well so plenty of Midlands area opportunities to come along for the ride. Well 2017 was an extraordinary period, with Major’s work turning up as far away as Dundee and internationally at Vancouver, Canada. I have now fulfilled last month’s promise to complete the work on the other bikes he built and it appears here. For the September MN ride, James and our associated cycling project have a small frame E-bike available to offer on the 2nd September to any enthusiast who would struggle due to age or physical issues. 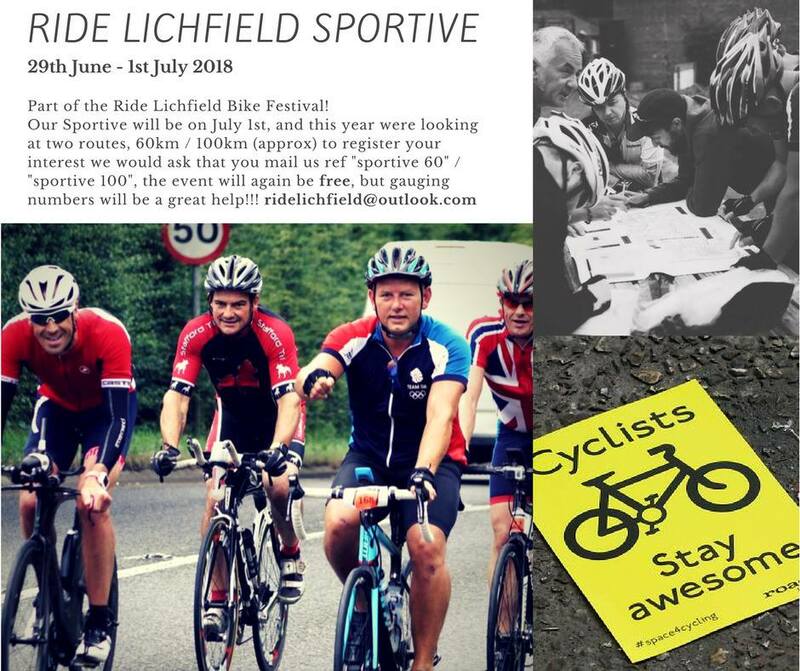 Lichfield Re:Cycle formally invite Major Nichols riders to join their second annual Ride Lichfield Sportive on the morning of Sunday 1st July 2018 in the classic bikes class. There is no charge for the ride and we will post details in due course. It forms part of the Ride Lichfield cycling festival. We already have a couple of takers. A chance to meet fellow MN riders and compete with the carbonites and perhaps see some other nice classic builds too. I hope you have all made your New Year Resolutions! At home there will be a lot on my plate in 2018 away from the bikes but I have decided to make a good start by posting an article on Major’s bike models soon and a second shortly afterwards on Major’s agents and the other bikes he built. Both are always going to be a work in progress and will exist to be edited and added to as and when new information comes forward. 1) The Anniversary MN Ride is on Saturday 5th May 2018 at Chaddesley Corbett. 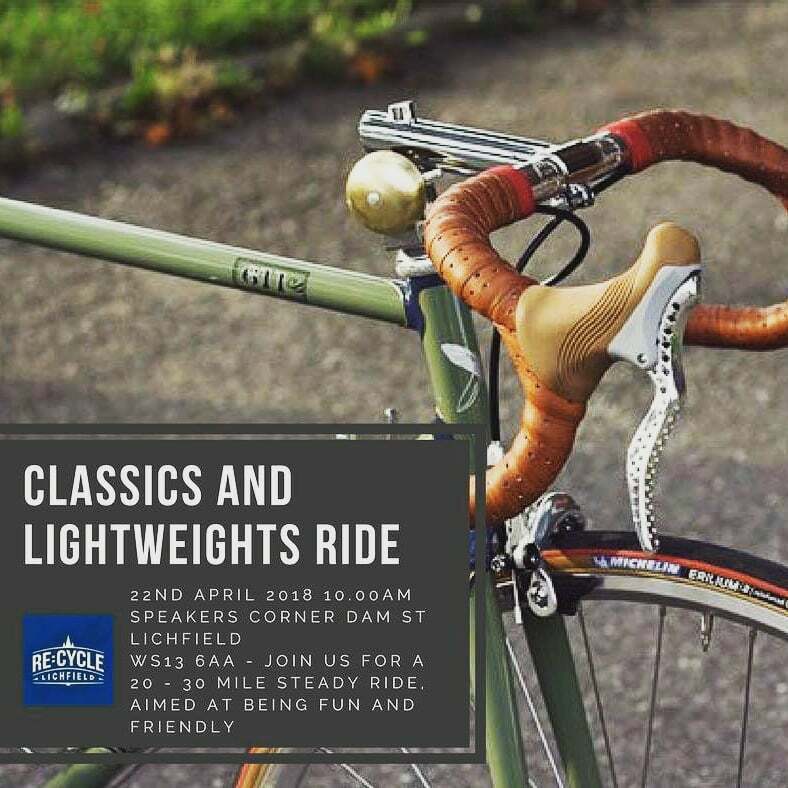 2) A project that James and I are trustees of is organising their second Ride Lichfield Sportive which will include a class for classic bikes and will formally invite MN riders to attend. There is no charge for the ride and we will post details in due course. It forms part of the Ride Lichfield cycling festival. Please contact us if you are interested so we can gauge numbers. It will be at 9am on Sunday 1st July 2018 starting and finishing in central Lichfield, in the shadow of the Cathedral. Likely to be 80k and 60k routes to be confirmed shortly. 3) Late Summer Absent Friends Ride on the morning of Sunday 2nd September 2018. From Lichfield again and for MN’s, Black Country and Brummy bikes and other classics. Christmas is a coming; the goose is getting fat, please put a penny in the old man’s hat. If you haven’t got a penny a halfpenny will do, if you don’t have a halfpenny, God bless you; and your Major Nichols. I am well into my second childhood now I suppose, but this website is keeping me busier than I expected. This month there is one rescued before the scrapman got it and a second that was a promise to someone that I would put it on as a Christmas present. There is probably one or two more in that category too. Next year, a group with which James and I have a deep involvement, are going to hold some classic bike rides and at least one classic friendly sportive on 1st July 2018. We will keep you informed and would be overwhelmed to see some MN’s! If anyone has a Prugnat Catalogue or a scan of one it would be much appreciated here as I have found them elusive. One would allow me to fill in some gaps properly. Having survived Hurricane Ophelia on our autumn jaunt to West Kerry in Ireland, I stood in her eye in brilliant sunshine and silent calm and was let off lightly with no more than a winter storm. We were lucky, unlike at least a quarter Irish households who lost power and water or suffered storm damage. As winter approaches, now is the time to restart work on Major Nichols, his bikes, riders and our social history. I have two projects to pursue on the boil, the first is on Majors ‘other bikes’ built for other ‘Names’ and his known agents. We have a fair amount about the Reform Street period but nothing post 1970 other than the assumption that relationships continued. Secondly a piece on the top eyes and wrap-overs he used. That should keep me occupied along with a bit of a back log and some social history and rider’s writings. Meanwhile James has a small stockpile of bikes and frames to begin to put on the site to keep it ticking over. 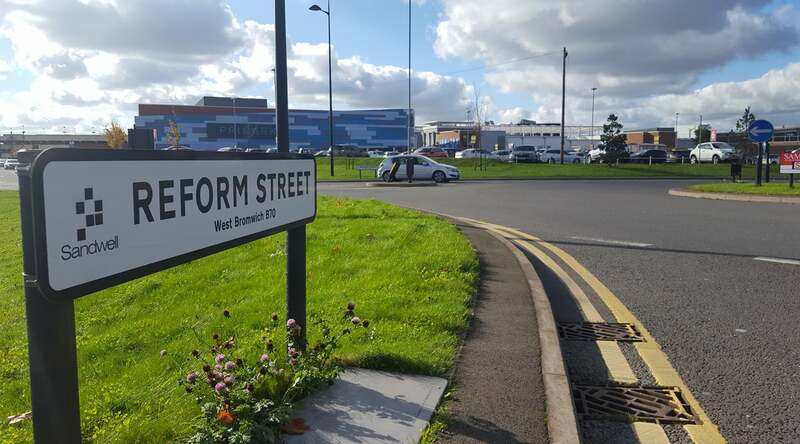 Recent photo taken at Reform Street, West Bromwich. Sad to say Primark does not stock any lightweights! The Late Summer Ride was as close to perfect as I could expect. The weather was good but not too hot, we started on time and apart from James puncturing just before the lunch stop at the Dog at Whittington and abandoning him to catch up, the first leg was fine. We ate, drank and chattered outside in the sunshine and then all agreed to take the 50km route. Surprisingly we all kept together on the afternoon leg, bar one who opted to zip off on a fast self guided extra route. We stopped for tea and unhealthy but nice cakes at the picturesque Fradley Junction. Lots more gossip and a trip down NCR 54 back into Lichfield via Cathedral Close to our start and farewells in Beacon Park. Thanks to those who turned up and made it a grand day out! More detail in due course in the ‘official’ write up which I have to do for the V-CC (The Veteran Cycle Club) when that is posted. It was my first ride on MN 71119, now refinished and reassembled the day before only just in time for the ride. A perfect day for me. Having tidied my desktop I find I have no shortage of material and my backlog is going to need some serious action over the autumn and winter after a surprising number of ‘finds’ and a continuing and growing interest in the Major Nichols marque. James has floated the idea that we consider a winter social event or gathering. What do you think? Any suggestions and ideas would be very welcome. This is a week early and a final reminder of the late summer Major Nichols Ride run under the V-CC umbrella at Lichfield on Saturday 2nd September. This year’s ride is a different route with three options after lunch bearing in mind age and fitness as we are becoming a more dispirit group. These are all fixed friendly routes too; of 16, 25 and 31 miles. Only the 31 mile ride has any drags to make you work on a social ride! Meet 10 am ‘ish’ at the cafe near the playground in Beacon Park (near Greenhough Road entrance, Lichfield, WS13 7AW) as in previous years and sign in for an 11am start. Up to four hours is £1 in the Greenhough Road car park and all day is £10 so if you are doing the longer ride we would suggest not parking there. You could try street parking nearby or the long stay car parks in the city centre for £3 tor £4. Beacon Park held grass track racing and had a cinder track too. There is a good play area for kids and the historic town centre and cathedral for a family group visit! After a 12 mile first leg lunch is at The Dog at Whittington which I believe was one of Major’s haunts. As it is Whittington Countryside Fair that weekend the landlord expects it to be a busy day though we should be there around 12 as lunch is starting. It would be of considerable help if we had a better idea of numbers attending as all food is fresh from suppliers on the day and the owner likes to make sure we get our first choice. So let us know you are coming and what you might like to eat. Advance orders would be appreciated and numbers please. See the menu here. After lunch and chat the afternoon rides consist of a choice between 14 miles with some hills, 8 flat miles or a 4 mile ride straight back to Lichfield. There will be a route leader available for the two longer choices. They will rendezvous at The Canalside cafe at Fradley Junction. A picturesque spot for those needing a restorative cuppa, ice cream or slice of cake. From there it is 5 miles back along NCN54 to Lichfield. Black Country and Birmingham bikes are also welcomed and I suppose even Mercians as Tom Crowther spoke so well of Major! The first job is to remind you that the planned Late Summer Major Nichols Ride will be on Saturday 2nd September starting as previously from Beacon Park in Lichfield. I am going to try to arrange a route which allows a short cut after the lunch stop for the less able riders but to retain a 50km full social ride for the majority. Details will follow soon. The ride is open to those on Black Country and Birmingham made bikes and we might even stretch to a Mercian if pressed. Do come if you can. Let us know if you are coming to give us some idea of numbers. There have been a fair number of bikes and frames appearing recently from our good friend Doug P, Hilary S, Ebay, garages, lofts and even a bramble invaded conservatory which have entered the processing stage onto the site so we think there are still a good number out there that have escaped the scrap man- so far… They will help in the story and to continue to make this site a worthwhile enterprise. People often approach me at tea stops to ask me about my bike and tell me snippets about their own experience and memories. They value the name it seems and have pleasure at the sight of one. I expect this is true of other makes but I still like Majors the best! The question is often raised about rarity. They become less rare as a result of every one found and that gives me the beginning of next month’s quick look at survival rates and the problems caused by the theft of the Durban Road shop records for post 1970 numbers and other key factors. After two and a half years of work on this project I have described over 60 frames and bikes which we have subsequently listed. Rather more perhaps than anyone here expected. Much of this has been due to the power of the internet and the annual memorial rides. There are still unanswered questions and tracks and trails to follow with scraps of information and leads that keep coming in keep us interested and on our toes for the long haul. The latest reminder for me was the finding of MN 71129 in June and then revisiting the closest number we have to it, MN 71119. Both built for racing men and both different in concept, design and components. One minimalist, a one off, seemingly from an earlier and richly successful age and the other finished in the fashion of the day as a known model but one of a line that had changed significantly through the years, the Record Road Sprint. You can see that kind of process for example looking at Raleigh’s five fine marques of their very popular Professional model at a different scale in the 1970’s. With Major, it seems that every frame is different in some detail; the geometry, the components from the parts box, the paint job and the transfers. His work appears to wander forward and back through time in a seemingly random way, yet by and large it fulfilled the needs of most of his clients and customers by keeping at the then cutting edge but using past successful experience to deliver his product. At least that is my ‘take’ on it in relationship to MN 71129. See for yourself on the gallery. Next month should be productive I hope as I have sorted out my ‘to do list’. I have a very special one to describe next so keep looking! 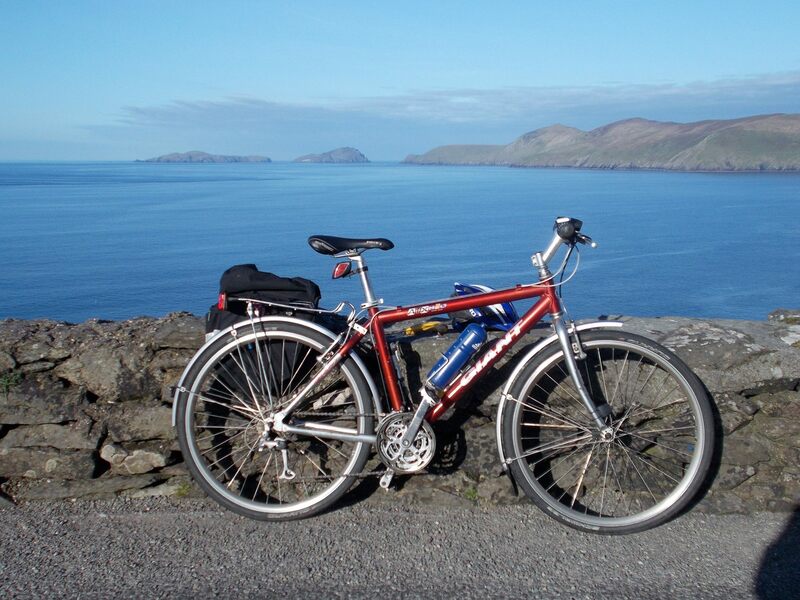 Website editor James on MN 74102 on a recent trip round Slea Head, Co Kerry, Ireland. The 12th Annual Major Nichols Memorial Ride – May 8th 2017. The event of the month in May passed off smoothly, some photos are on the site and Alvin’s account and relevant bike snaps will be added in time. It passed as it tends to, with many of us getting lost or sidetracked in the Bobbington hinterland’s maze of lanes and re-gathering at lunch and tea in the sunshine. 20 Major Nichols riders and 15 on other marques including Jack Holland, Viking and a Knight. 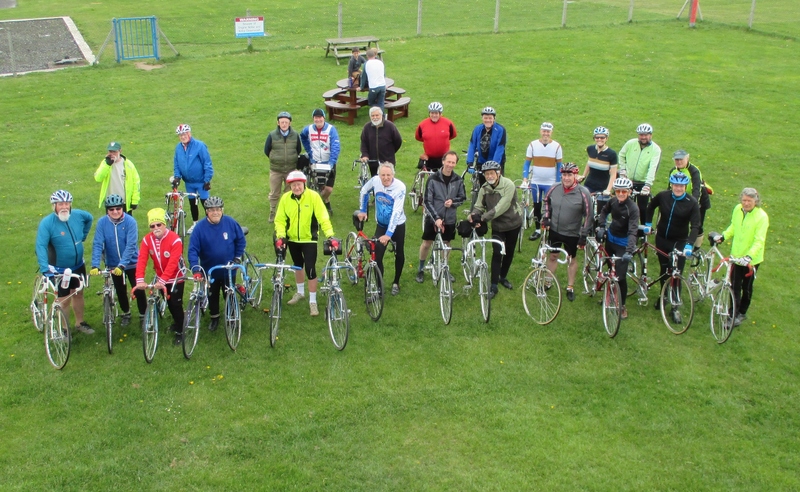 Riders came from as far away as Devon and the South Coast, new friends and many returns. Alvin’s mugs were good too! Thanks to all for turning out and making a fun day. Put 2nd September in your diaries; our Late Summer MN Ride from Lichfield. Make it a day out for your family perhaps as we start from Beacon Park where Tommy Godwin and many others raced on grass and a now lost cinder track but there is a good play area and a cafe. It is an easy walk to the Cathedral and the compact historic town centre and plenty to see and do for a wife or partner and family. Out on my ATB a couple of weeks ago to try the grass centred back road from Ballyferriter on the Dingle Peninsula to find an easier more scenic route to the top of the steep 190m Mam Clasach Pass which was raced over on the last Tour of Ireland. About 3 km into the ride and just part way into the steep section from Marthin Mor to the road over the pass and at 140m gain I broke the chain. I cursed and wobbled to a halt. I dug into my bag for my multitool and found I had the one without the chain splitter. No emergency punch and no spare split link. No going on then… I hauled the chain off and as it was almost all downhill to our hideaway, settled for a mix of freewheeling and a sunny walk back. I’ll try another day and won’t make that mistake again. James wants to ride the cat 1 Connor Pass here on his next visit on MN74102. It is also on the TOI route. This was a machine owned by Andy Hayes who rode for the Oldbury Club. Later he was a pro rider in the early 80’s. We would love to hear from him! A batch of MN Frames courtesy of Doug Pinkerton will begin to follow this month as they are now being written up. 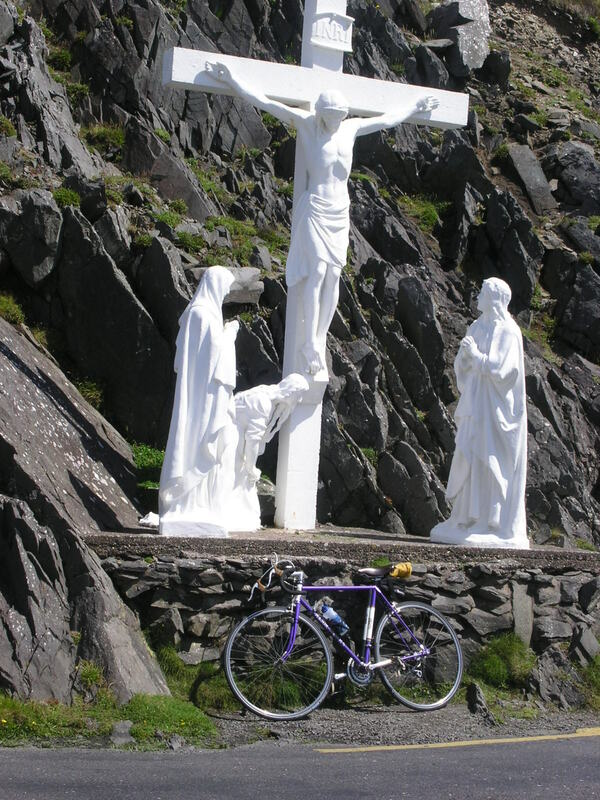 One is associated with the Tour of Ireland so there is a link of sorts to my wanderings. I wrote this on 1st April before 12 am but this is of course, not a joke or an excuse. I am sending it to James belatedly as my broadband connection has been down. It is now fixed and I now have some time to start to catch up. April will certainly see some more additions to the gallery and with activity on Ebay and the continuing power of the internet to gather lost contacts. Alvin, Tim, Felix, James and I look forward to seeing as many of you as possible at Bobbington Airport from 10am on Sunday May 7th for the 12th Annual Anniversary MN Ride. See last month’s editorial below for full details. John Barber, an old Hill Top CC team member will be back from down under and will be riding my Purple Peril as his MN is in a container on the journey back to Blighty. Major was Club President at our time there. It will be good to reminisce. You don’t have to ride an MN as Black Country or Brummagem bikes are very welcome and so are any ex MN riders or enthusiasts. There is a lot of talking to be done so come if you can. For any of you who no longer ride you can of course join us at the Red Lion at Lunchtime or the Airport Cafe from 3pm or before the ride starts. I have been distracted once again through February, but have done some reorganisation of my lack of systematic approach. The result is a list of frames and bikes I need to write up. Finds this month include a beautiful blue Mixte, a late RRS and another unidentified model with it. The Mixte has however moved on but we would love to hear from the new owner. The others need extracting from a large gathering of bikes and need to be photographed and recorded and I wait with baited breath as they are both stunners from the little that can be seen. The important information this month is that Alvin and Tim have produced details of the Sunday May 7th Annual Anniversary Ride which will start again from Bobbington’s Halfpenny Green Airfield. The late summer MN ride Saturday 2nd of September will be held again in Lichfield and we will be looking at options for a route with shortcuts but last year’s remains a good possibility as the lunch and tea stops are both good. Details later. January has already provided more work for me in the form of three bikes and has thrown in the knowledge of another transfer I have never seen. Hopefully the bike owner can find a pre-refinish photo. It identifies an Italia model from the 70’s. With luck, this, together with a fine 26” frame from 1968 and an unusually fitted out tourer will appear soon. All three well used and much loved. February marks the beginning of our third year of the website and closed Facebook group. Don’t forget to put May 7th in your diaries for Alvin’s Annual Anniversary MN Ride at Bobbington Airfield close to Wombourne again this year. Also our third Lichfield MN Ride on 2nd September starting at Beacon Park. We will post details as soon as we have them. 2017 will see a few changes to the site, some error corrections and minor changes where I have been able to identify component parts for example. More importantly for users, we will begin re-ordering bikes numerically to 1970 into what we believe to be build order and after that to continue in numeric order but give what we know as the build date from receipt data. We also need to cope with Major’s post 1970 numbering system on the other machines using evidence gleaned from build components for example. This should be a bit of an improvement on only really knowing the post 1970 decade of the build in some cases. It should give a better and more consistent illustration of Majors changing style through time and for users of the site, give guidance where a frame needs refinishing and the owner wants better period authenticity. In view of the growing content of the site and the desire to rid ourselves of adverts, we are exploring the possibilities of enhancing the site and have set up a Donate page to explore this and other ideas our readers may have. I will certainly be in a position to post a ‘parts box’ for components we know he used as an ongoing topic with some background references where these are available. 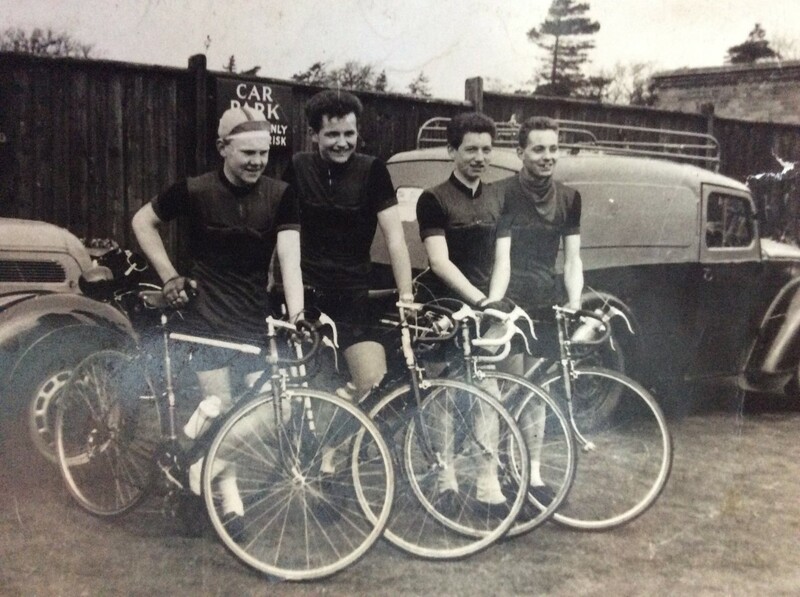 Hopefully the Hill Top CC will emerge somewhat with Luke Willan’s find of a print of their 1951 fancy dress ride and with luck, some words from ex riders. Please take the hint guys and girls; I need some more stuff about the club! Nonfiction books are always difficult things to research and complete and I have the greatest respect for people who do. We have already overwhelmed Alvin with new finds but we all need to encourage him to finish his reference book on Major so please support us and ask him gently to hurry up and forget his other passions like Paris and Rensch because you are all, like me, in wretched misery waiting and willing to buy a copy! 2017 would be great Alvin! There will be two formal rides in 2017, Alvin’s on Sunday 7th May and mine and James’s on Saturday 2nd September. Make a note and watch our editorials for more detail. We are thinking about organising a classic bike sportif/audax/show/family etc event for our developing community next year as a celebration of Major and all other West Midland builders. We may have a trial in 2017 and a proper event in 2018. Would we get enough support do you think? Although page views on the site has remained constant at around 20,000, the number of visitors has grown from 2,500 in 2015 to 3,300 in 2016. As you can see from the map below, visits from every corner of the world! The number of frames on the site currently stands at 59 and thanks to our prominence on search engines a good few have come this way in the last twelve months that were previously unknown to the marque enthusiast. I am looking forward to adding more bikes to the site each month for as long as we are able to find them and hear the stories of those who rode and continue to ride them in 2017. This is the second Christmas edition since our launch and the year has been an eye opener with a continuing list to add to the peloton. Thanks to all who are keeping us on track too! We know there are more delights on the way and we hope to see lots of you next year at Alvin’s May 7th Anniversary Ride or our September ride in Lichfield. If you would enjoy a social evening next year, perhaps in the Lichfield area let us know. It would be a great pleasure for me to sort out and the area is fine for fixed wheel if we wanted to ride and rich in pubs including ones visited by the man. Have a great Christmas. Mine has already arrived having put together the little injured and now repaired MN 7258. Thanks to Trevor Jarvis for saving the Zeus Competition rear dropout and replacing the stripped gear hanger (see revised listing). She is now ready for a short Boxing Day jaunt to Fradley Junction if the weather is OK.
Two very nice early bikes have just appeared. One was originally owned by the 1953 winner of the White Hope Trophy, Ken Lowe, a 1957 track frame currently on Ebay and also now on the site. The other is a very early frame from 1954 that cropped up via our closed Facebook group. Have a Happy New Year and remember we need to record history before it is forgotten so please let us have any contributions you may have. Best wishes from Alan, James and Alvin. 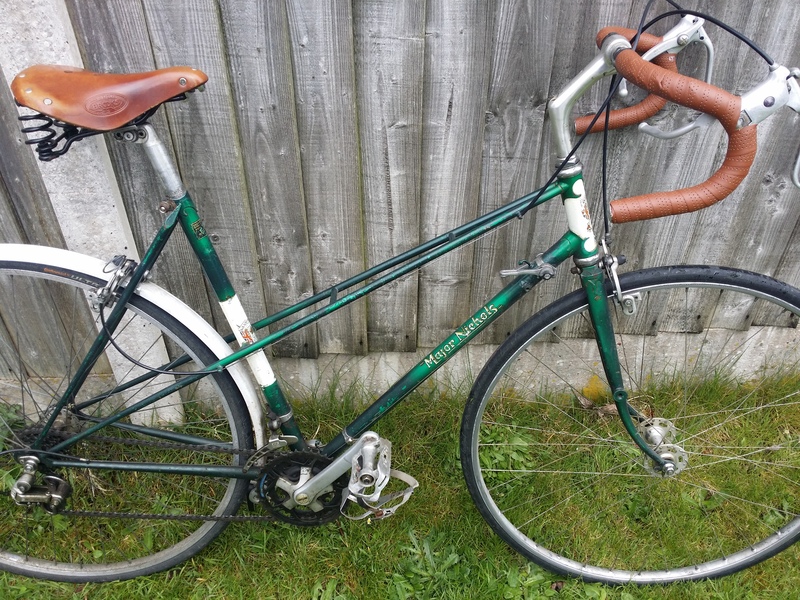 I have been distracted recently with domestic and Lichfield Re:Cycle project tasks which have included starting to fit out a Dedacciai Sigma TT bike for a friend of the project and to refurbish a Mercian King of Mercia, both potentially excellent machines. Added to that James has started a new job and his time has been taken getting up to speed, so apologies for slightly neglecting the site from both of us. Fortunately there is a stockpile of items for James to attack and I hope he can find the time to post some of these and I can re-gather my enthusiasm and keep things moving. A special item for me to finish is a longstanding one. Dave Clement’s bike. He worked for Major in the early 60’s and later had a frame made by him. He sold it a few years ago, repurchased it and has recently passed it on to a trusted and deserving new long term home. With luck we will see it next year at the Major Nichols Anniversary Ride in May. Out of the blue MN 7345 arrived a couple of days ago, another of his ‘best’ frames. It lives in Vancouver and is going to be our first Canadian offering. Just waiting for some photos to finish writing the description. I will be back in England in a couple of weeks after 6 weeks of walking the pup two or three times a day on Irish strands, listening to and playing music accompanied an odd glass of Guinness and good company. The terrain here means tougher miles than home which makes the grand little Giant aluminium hardtail I keep over here so very useful as it opens up all sorts of more difficult tracks and trails to me. She will, I hope, be supplemented by a little MN tourer next year for some longer road rides simply because I like MNs and can carry waterproofs and stuff in a carrier. My pre-breakfast 10 mile ride here when the weather allows uses back lanes and had 530ft of climbing. The views were so good I just had to stop and admire them….. My 20 mile coastal ride has about 860ft rise with no need to stops for views. Beautiful all the way. The September MN ride was a success and we will repeat it next year. Meanwhile we are going to have to wait for Alvin’s May 2017 offering. 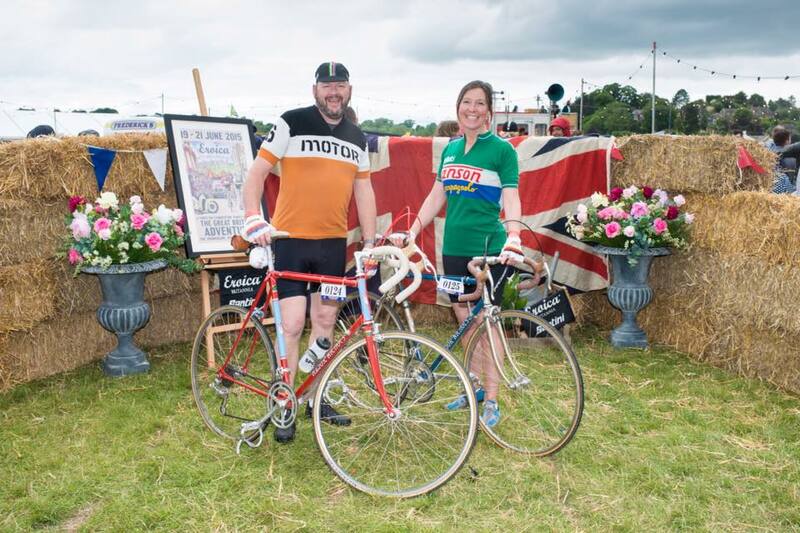 We hope that someone will send us some photos from this year’s L’Eroica Britannica and hopefully the proper Italian one at Gaiole in Chianti later this month. I hope people thinking about refinishing their frames will read and take note of the research put together in The Major Nichols Finish – Paint and Transfers as a lot of time has been invested in it to supplement the record. We personally encourage people to save his finishes and refinishes where they can as Major isn’t around to put refinish errors right! If there is no prospect of saving a finish then please consider the guidance offered in the research especially with pre 70 machines or contact us if you want reassurance or help. Top eyes, transfers, bands, panels and Reynolds decals are key areas to consider as fashions changed and it is easy to be inappropriate to the time of build, too modern perhaps and to make choices that don’t work. My personal philosophy is if the frame is at real risk of rust through inaction and the finish cannot be well touched up then consider a good quality refinish either copying it as it is or time appropriate as in the case of MN 71119 which as you can see was very bad and needed other work. 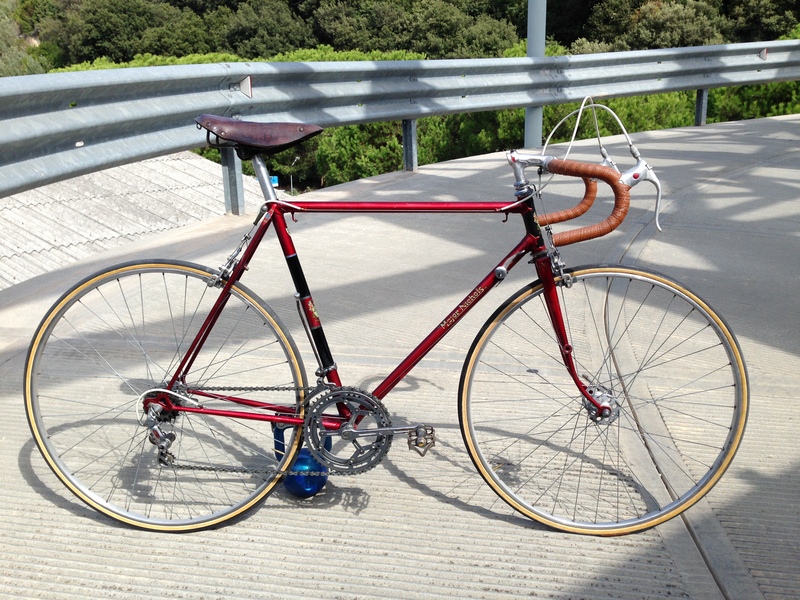 The refinish colour was based on another bike owned by John Williams of a similar age around 1980. I was fortunate enough to get original transfers from John. Another frame has scruffy but generally sound paint. I can live with the patina and enjoy the original transfers and stop and touch up small areas of rust. Alvin has one of Ant Taylors frames which has areas of poor paint and touchup is proving difficult. But for a frame with serious history it would be a sin to refinish it, even in identical paintwork and decoration. He is working on the issue and I am going to get to grips with airbrushing for a similar problem soon. One guy we know about chose to destroy his MN frames rather than pass them on….. yes, at the end of the day it is your bike and you do what you want with it. Do think about it though as Major’s own work has a value. August was a good month, two 1950’s bike frames and three others turning up. 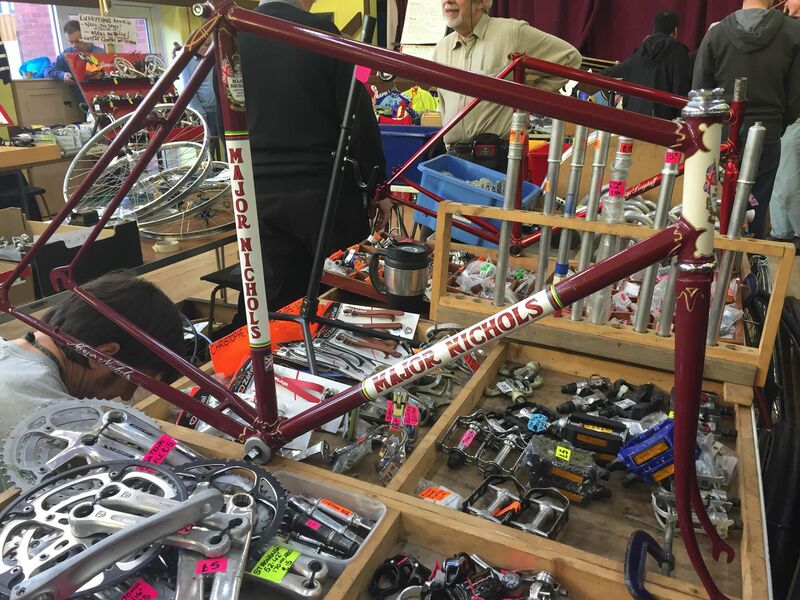 Then Doug Pinkerton advises that he still has four rear triangles from Major’s cellar which he would love to add stays to finish as new custom frames. He has forks that will match too. It means I will be busy writing things up! One of the 1950’s framed belongs to the well known Hill Top rider, Ivor Lakin, whose son has contacted us and I hope will send us some photos of what, so far as we know, is Major’s first fillet brazed frame. There is the beginnings of a new Hill Top CC section, of which Major was President, thanks to several old members and especially Ivor, whose first photo shows the Hill Top Team of Peter Scoltock, George Searle, Colin Hitchins and Stan Norton. Major’s van is behind them at Bassets Pole before a road race. 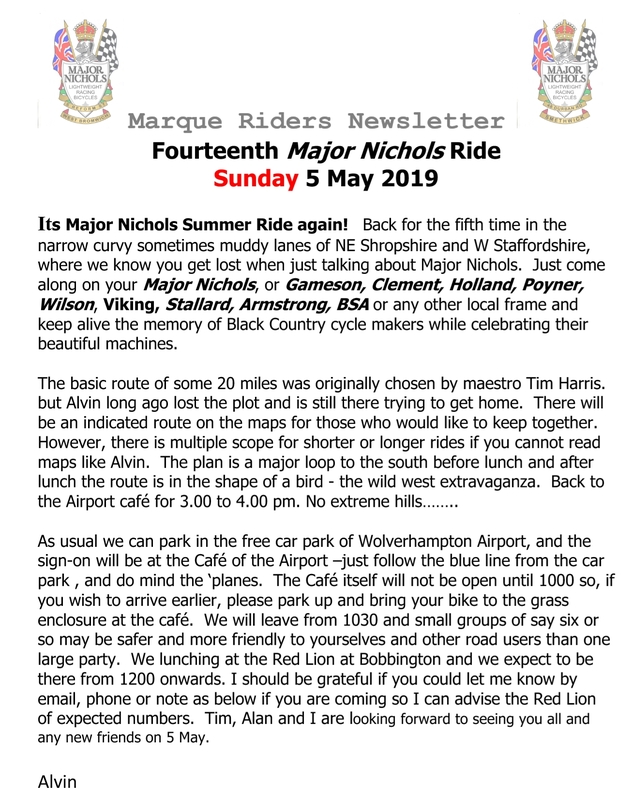 It’s the Lichfield based Major Nichols and Black Country and Brummie bikes ride this Sunday, full details can be found elsewhere on the site. Look forward to seeing those who can make it. Slightly later than usual but I have been putting the finishing touches to the Paint and Transfers page. We hope you enjoy it and send any additions or revisions as you feel necessary. For those who like statistics, we now have over 50 frames recorded and the website has had over 32,000 views so far. Thank you to everyone who has contributed along the way. Below are details from Alan about the September Major Nichols ride starting in Lichfield. Major Nichols Late Summer Ride – for Major Nichols and Birmingham and Black Country bikes too. Sunday 4th September. 10.00 to 10.30am meet for 11 am start by Beacon Park Playground bistro/cafe. Following a successful trial in August 2015 we will be holding a ride based on Lichfield. The terrain for the basic 25m ride is pretty flat and suitable for fixed gear machines. Mostly country lanes. There will be a lunch stop and a tea stop. There can be an added optional loop of 10 or so miles for faster riders after lunch if requested with more testing terrain which will need gears. Meet again at the tea stop. Full details will be on this site and the Major Nichols closed Facebook group later in August. The start will be at Beacon Park, Lichfield and there is free Sunday parking at the nearest car park on Greenhough Road. Meet at the café 200m away in the park by the playground from which we will start. V-CC Rules for main ride. On your own for added loop! Contact 01543 255352 for details from mid August. Leave a message if need be. Let me know if you are coming please as lunch numbers may be vital! Alvin has finished his Memorial Ride report for the next V-CC News and Views magazine and it appears on our site here. 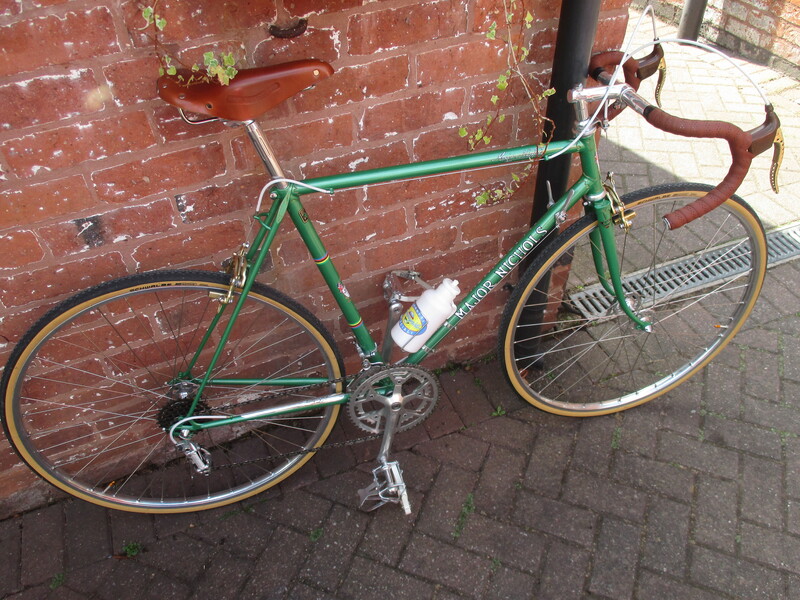 Also we have John Gilberts bike up on the site, a welcome surprise from the day. I have been writing up a few new found bikes while I am away which all have their own individual quirks, including MN 7144 which appeared in June on the Ebay site. They fortunately continue to ride out of attics and sheds (sometimes with nasty added paint) for our enjoyment to reinforce the legend we enjoy. Back in Ireland for a while and enjoying the sun and calm conditions. The May ride was a great success and Alvin’s report will be available soon. 30+ riders and some that came a day later despite the efforts to let people know it was on Saturday. Still, in the spirit of Major they did the ride anyway and hopefully we will see them in September too. I have the photos from the ride and await the owners names and such frame numbers as Alvin gathered on the day. James is editing photos for Major’s Finishes and Transfers and doing the layout ready for posting. Meanwhile I have one or two to write up as soon as the novelty of being here and enjoying life in fine weather is replaced by colder conditions, sea fog, wind or rain. May is here and that means one thing! Alvin and Tim’s Annual Major Nichols Memorial Ride. This years is the eleventh ride and is happening on Saturday May 7th. Join us if you can. Full details are on the site here. Alvin and Tim have been organising and running the ride under the umbrella of the Veteran Cycle Club (V-CC) of which I know a number of owners are members and thanks to those guys for doing it. At £25, club membership is great value and the magazines they produce are excellent. Check it out via their website. James and I will be organising a ride for MNs, Black Country and ‘Brummy Boikes’ on Sunday 4th September from Lichfield so put it in your diary. Details closer to the date. As an aside the basic route will be OK for fixed gear. Nothing too testing, but the add-ons may be a different matter! Well, presently I am on Ireland’s west coast. Weather as usual for the time of year, wet, windy and while mild, the wind-chill is significant. But it is still a nicer ride to the shops than at home in Lichfield. It will be good to have enough miles in the legs to get round Bobbington in May. Hopefully the Force will be with me as Star Wars V111 takes over the cliffs of Sybil Head a couple of miles from our base. 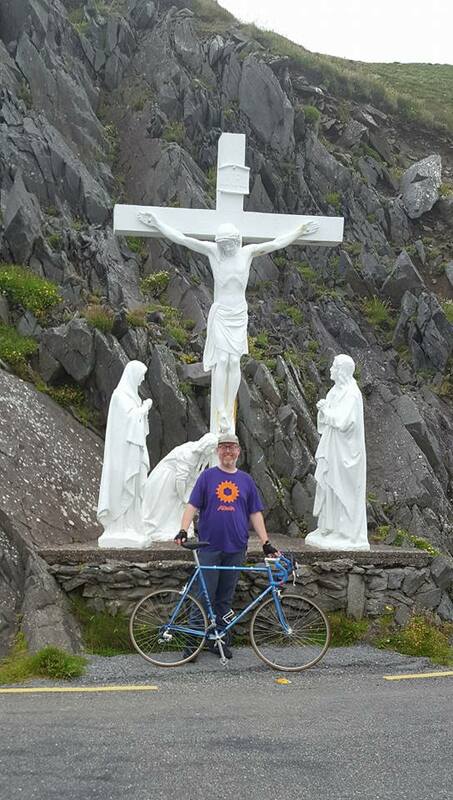 As a longstop, when I stop to admire the view at Slea Head, the surrogate inhabitants of the Shrine there who peer at me or inspect my parked bike might grant a blessing. We hope you all had a good Easter. Lots of choice of Masses here, but none of the Critical kind. I have been reworking the Finish and Transfers section readying it for posting. With luck this may happen this month although it will not be fully illustrated until I am back for the ride in May. It will remain as work in progress, awaiting a couple of illustrations of the more unusual shield transfers which were rarely used (which I have at home to scan) and feedback from consultees. After that it will still be liable to change but I hope it will be a useful reference for owners of frames that have lost their original finish and identity. When seen together with the gallery photos a good refinish plan is possible. The plan is to put together a style section which may also help. Spring is apparently with us, the hawthorn hedges are tinged with green and the blackthorn is about to flower. Our collie pup has an as yet unidentified allergy but seems to be stabilizing so I am feeling less stressed and managed some miles last weekend. Importantly MN71119 came home from Bob Jackson’s and the results and service and especially the very well done double fishtails were pleasing. Maybe things are getting better but I still have to find time to rebuild her for the September ride. I have been prodded by 2 MN owners to get their bikes on line and asked by another to advertise a mid 60’s machine. Ok guys, it is all in hand, honestly. They are all too good to ignore! Alvin has the May 7th ride in hand which will be focused on Bobbington again so keep in touch with progress. It will be a different route this year which I am assured will be known by the leader! This is our first anniversary edition! So a special thanks to all those who have added to the record and made this site and its ancillary activities worthwhile. James gave the site statistics late last year and it seems from my growing work list that there is still a lot to do for the marque and its followers. Alvin has confirmed the May 2016 Anniversary ride will be on Saturday May 7th probably at Bobbington, but with significant changes to the old route. We will firm that up and let you know when the route has been finalised, driven and ridden! James and I will run the Lichfield based MN Ride on Sunday September 4th. That will be a re-run of last year’s route of 50km with possibly a different lunch stop as the Dog at Whittington has changed hands. We are thinking of planning an additional post lunch loop option for our fitter members to make an 80km ride if there is interest. So let us know please if you would like that. We just have to find a suitable leader and sweeper if you do! Full details will appear in due course. Alvin will hopefully be there too, free of duties for a change to chatter with us all. Both rides will be under the V-CC umbrella and visiting classic cycle riders and enthusiasts will be very welcome, especially on Major Nichols machines or others built in the West Midlands. Meanwhile enjoy the our February offerings, including an unusual MN and another little MN. Next month will mark the first anniversary of the website and so far we seem to have gathered a number of significant machines in terms of their riders, construction, machines in exhibition condition and transfer decoration. Also we have seen the formal recognition of two models. With the recent finding of a Mazzepa we think we may have completed a list of all the significant transfers. This will now be fully illustrated and published on the site hopefully in the spring after consultations have finished. It will be a useful guide for owners. A start has been made on a find of identical (well almost, but not quite) MN finished Gamesons. As an aside to this we am going to start a section page on Gameson bikes to supplement the page on the Classic Lightweights website to test whether we can tease some more owners and frames out of the woodwork to try to get a better understanding of their numbering. There seems to be no other formal focus for recording or discussion. I think the highlight of 2015 for me was finding the family of a team mate who rode with me in the Hill Top as a junior. Both on Majors of course and featuring in our sepia editorial header. Me, Dave Reynolds and Les Flavell, the club’s junior Joker. Sadly Dave died in a car accident many years ago but one of his sons has his last MN bike and hopefully will join us on the memorial ride in May. What would make 2016 for me would be to find Dennis Troman, Les Flavell and also Alan Lloyd who was junior captain and later a great rider. Please, if anyone knows their whereabouts or has contact details, let me know. 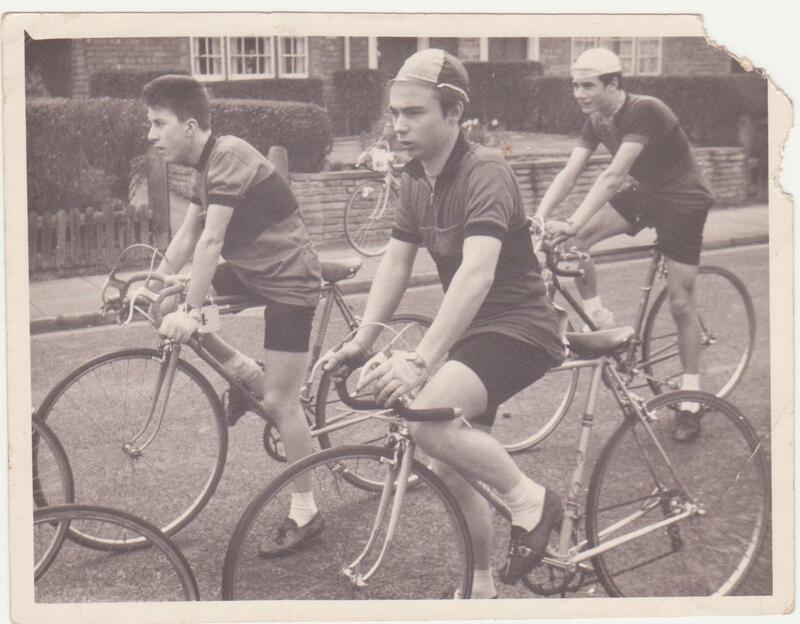 Hill Top Junior 30M Road Race start line up circa 1959. Left to right: Alan Lloyd, Alan Richardson, Dennis Troman, Les Flavell, Dave Reynolds. Photo Bill Skidmore. Christmas is almost here and I have been trying to catch up with visits to see as yet unrecorded bikes and frames. The last was less successful than I hoped as my camera conked out and left me with less than half the shots I needed. I will have to make a repeat visit. Hey ho. But two to write up eventually and another enjoyable trip guaranteed. MN 71119 has been to visit Trevor ‘Flying Gate’ Jarvis for some TLC but is back with me now ready for refinishing. Flying Gates have been re-launched and now 2 young talented frame builders are working with Trevor. A nice website to visit too. Both the frames at Hilary Stone’s appear to have been sold. We know where one is but not the other. Hopefully it will reappear in due course, ideally in better paint. Alvin’s nice blue tourer is off to a new home soon too. 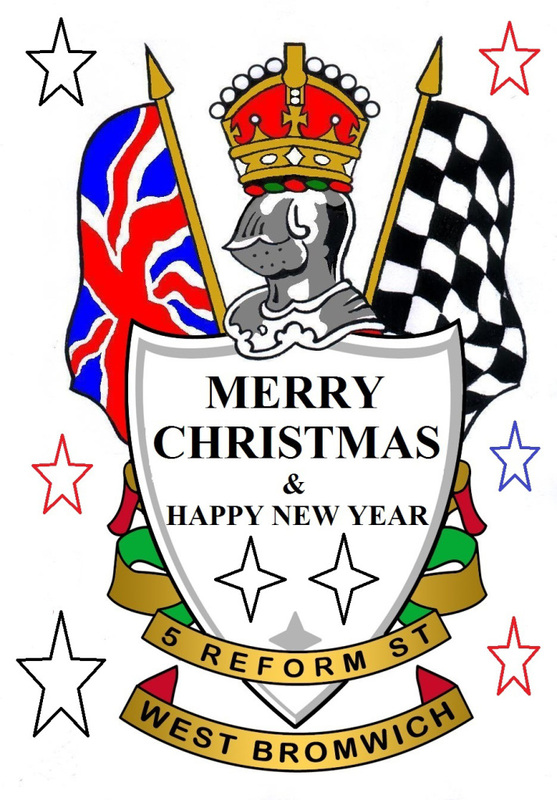 Anyway, a special thanks to our contributors in 2015 and a Happy Christmas everyone, hopefully we will see some of you on the 2016 rides. My family has entered birthday season and this continues through ’til December. Add a working sheepdog pup to the mix and my attention has been straying from the site! Our trip to Birmingham to see Sean’s bike was good and I have at least two more trips to make in the Wolverhampton axis to look at a number of machines we have not seen before. I am told that there will be another nice MN tourer for sale soon by negotiation and that will be put on the site as soon as we are asked. Did anyone ride an MN in the proper Eroica in Gaiole this year? Gianluca has asked. He rode a 1914 Ganna, a classic early Italian machine. His rear wood rim broke in the later stages of the 200km route and he had to retire. No such problems with his MN in the year he rode that! Let me know so I can put you in touch. Having just checked the stats, I can report that in the 9 months since the site began we have had over 2,000 visitors, generating 17,000 page views. Hopefully we are near the top of the search engines and the steady trickle of fresh correspondence perhaps proves this. If anybody has any suggestions for the website please feel free to get in touch. September has been an exciting month for us and Alvin. He has been told of an amazing find of MN frames found behind a wall! One at least, as expert Hilary Stone would say, is ‘Rather Special’. Hopefully more information sometime later. To help our serious side please could people who bought MN Frames and bikes from new from 1971 onwards read this! If you retained your receipt could you ideally send a scan or photocopy. Alternatively tell us the date the frame was ordered (month and year), the date of the receipt (month and year) and the frame number. If you have no receipt, no matter, cast your mind back and see if you can remember the year and month you paid up and the frame number and let us know what you remember. Email is best, see Contacts or ring Alvin. It has a serious bearing on our understanding of his numbering system. Thanks to those who have sent us copies. Alvin may have some more work to do soon! 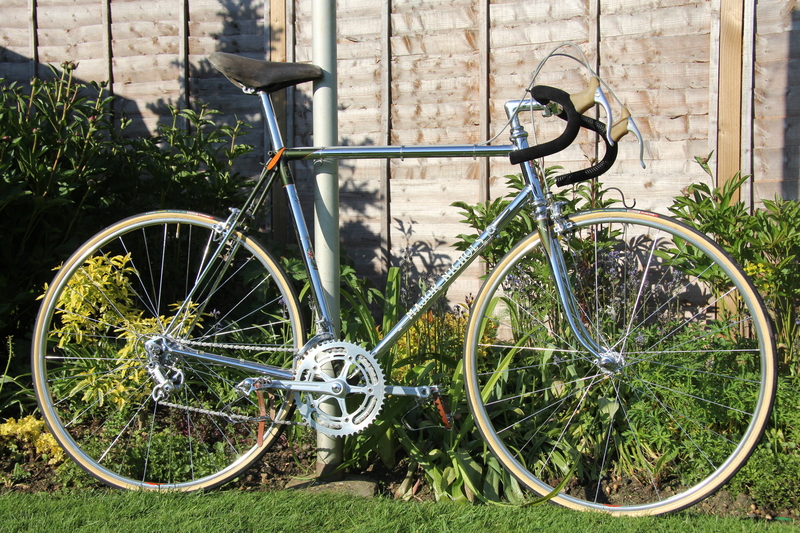 Oh, and we now have a ‘For Sale’ page with an owner offering a 21.5” MN tourer in excellent original finish. In the New Year we will be asking for contributions on the clubs that used Major’s frames and their riders. I have my own bits on the Hill Top and will start with that for what it is worth. So Hill Top, West Brom CTC, Dartmouth, Oldbury, Saracens, Halesowen, Walsall Roads and the rest please prepare to help us if you can! Late news. The owner of the late 50’s early 60’s Ruby Red and Ultramarine frame has recognised it on the site and sent us pictures of her now. So see the revised post and welcome our first Italian owner Gianluca! On Saturday August 22nd we rode the trial for next year’s formal Major Nichols ride, targeted for late summer or early autumn of 2016. It went better than I expected and throughout the ride, lunch at the Dog in Whittington and tea stop at Fradley Junction, the chatter was pretty continuous. Everyone seemed pleased with the day. I certainly was. It was hot and muggy but the rain held off and by the time I reached home I had topped 50km. The ever classy John of the Walsall Roads on his cracking little MN that looks almost part of him, rode to the ride and home again from Great Barr, about a 100km ride out and back over Barr Beacon. Roger Johnson’s refinished Nervex Pro was lovely and has some seriously special bits. Thanks to James, John, Roger, Ray, Alex, Gary and Stuart for turning out and making it an excellent day. A few more snaps can be seen via the local Lichfield cycling blog here. July was a busy month with correspondence, finds and stuff to write up. We hope to be be able to do some postings including at least another one significant to cycling history and my favourite ‘Majorese’ paint job on a cracking frame. Informal MN Ride 22nd August. My personal annual Absent Friends and Birthday Ride is being subsumed into the MN informal test ride for next year’s extra ride to add to Alvin and Tim’s for the V-CC. Any bike will be fine, at your own risk. The ride will be suitable for fixed gear and will not be quick as I have to be at the front! We may suggest a couple of loops for those wanting a bit of a dig. Park in the Council Pay and Display Car Park at the end of Greenhough Road, Lichfield at 10 for a 10.30 start. Parking charges are very reasonable. Meet at the Beacon Park Bistro 250m SW of the car park by following the footpath along the side of the pitch and putt course past the Beacon Park play area for coffee (or breakfast if you need it). Toilets are just across the stream bridge. You could meet us at the lunch stop yet to be identified or the finish at the George and Dragon’s beer garden in Gaia Lane for tea and chat. There will be at least one ‘new’ MN to look at. The route details are yet to be finalised and posted. If the family needs a day out, bring them too with a picnic perhaps as the venue is in easy walking distance of the Cathedral, (which we will pass on the ride) and the historic city. There is a skate park also used for bikes and a pretty good range of play equipment for youngsters in Beacon Park and a nice public pitch and putt course too. Please contact us to tell us you intend to come as it may guide the choice of lunch stops! Alvin Smith will be along as well. Terry has suggested taking a few parts to swap or sell. Always a nice idea. 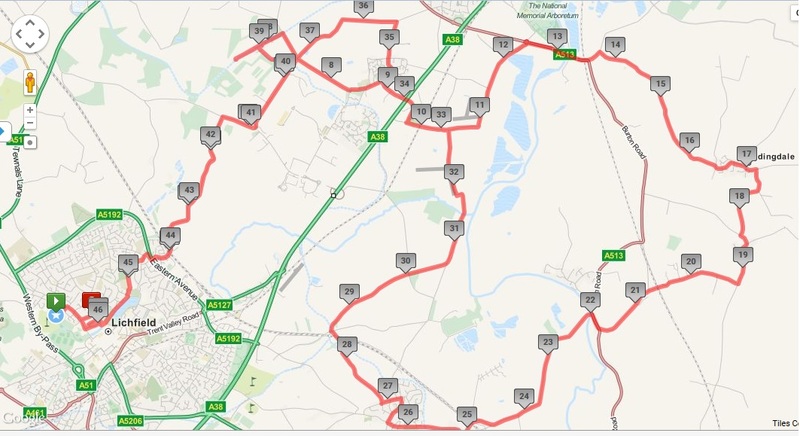 Route for Saturdays ride below, as above then 16 or so miles via Edingdale for lunch stop in Whittington with 14 miles back to Lichfield with an option for a loop for the quicker riders. Away in Ireland for the summer and on rainy days here I have been working on a new batch of MNs for the site including the two rediscovered MNs numbered 6961 and 7116, Ant Taylor and Phil Bayton’s TT machines. Also looking again at some ‘possible MN’ builds for a new page illustrating the difficulties that face identification. I am looking at producing a new section on Major’s Transfers so far found as a reference document to start the long promised ‘parts box’ in the Autumn. Finally there will be an informal MN ride on Saturday 22nd August to reconnoitre routes and watering holes for a formal late summer Major Nichols ride under the V-CC umbrella next year. All welcome especially MN’s but Brummagem Boikes too. We will be discussing whether riders want a longer option of say 80km next year as well as the 50km ride we are planning, together with a 20 to 30km option for those who come primarily for a chat. The ride will be in the Trent, Tame and Mease valleys and will start in Lichfield. It will be very suitable for fixed gear but hill options can be added. Mostly on lanes except exiting Lichfield and a couple of short lengths on A roads. Finally a photo that came from the Major Nichols Cycles Facebook page taken at Eroica recently. There is also our Major Nichols lightweight racing cycles closed group on Facebook too. This website has had 1000 visitors and 10,000 views since we started earlier in the year. Thank you to everyone who has contributed so far. Well, the 2015 Ride has been and gone but we have Alvin’s report on the ride to supplement ours. You will enjoy it! Meantime we are left with extensive fall out in the terms of previously unknown machines and transfers and, I think, a lot of work for the summer. We have the ride start list and names but we have to put faces to some of them. Most we know but I believe there are a few still to match up. The closed Facebook group has kicked off now and is getting interesting posts so you can ask for an invite and see for yourself! Below is a story to share that came via that group from Wayne N.
“Remember Major Nichols well. My Gran lived in Raglan Avenue. She would send me to the shop opposite Majors on the usual errands. I would look through his shop window at his frames and wish that one day I too would have one. Moving on some years to when I got my first job, I went to Major and we talked about me having one built. I was aware he wouldn’t just make one for anyone but he knew me from looking through his window and from time to time popping in for bits or advice. He measured me up and we talked about colours. I wanted British Racing Green with red and gold lug lining. I only wanted the frame and would dress it myself. The order was put in and deposit paid. Unfortunately this story doesn’t end how I wanted it to. I visited Major to find that his shop had been burgled and that it was becoming a regular thing, he explained with very colourful language that he doesn’t know yet if my frame was there or not. This would have been the early 90’s and I think by then was beginning to wear him down. He would however still talk about his time in the Navy and his part in the Enigma machine which at the time meant nothing to me. May is a key month for us. The 10th Annual Anniversary and Centennial Major Nichols ride is this year at Wolverhampton Halfpenny Green Airport and promises to be as good as ever. I suspect we will welcome a good number of extra riders and things to see. So please come if you can: on your MN or other Black Country or Brummy Bike and enjoy the day. (More details can be found here). 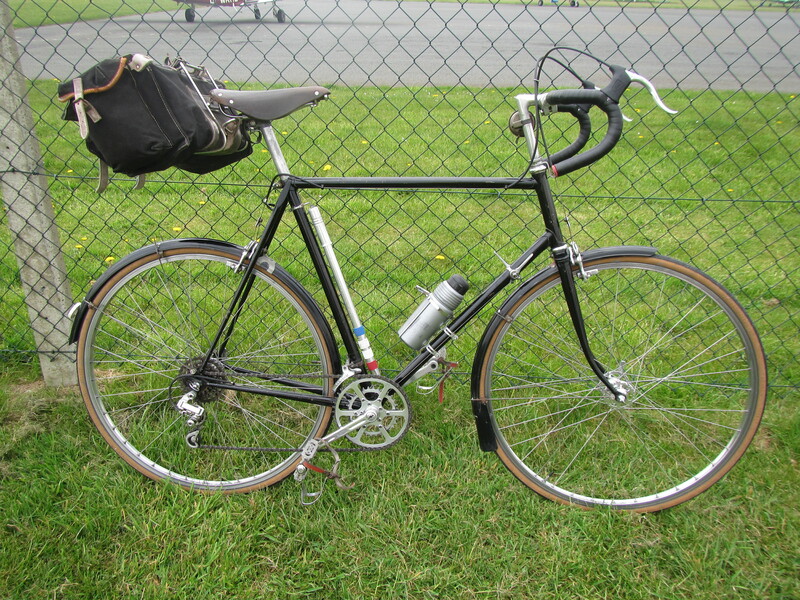 There have been some good ‘turn-ups’ for the site and this find, a beautiful ’63 Mixte added today will be at the ride. There will be more to be added later in the month. I will be getting my own MN 71119 back from repair and ready for refinish on the day and will have another with me. Come and see them first-hand and raise a glass to the man who built them who would have been in his 100th year. The website has been running for three months now with over 3000 hits from all corners of the globe. We are both learning a lot and as the site rises higher up the search engine results we will hopefully see more contributions of frames thought lost to the mists of time. We will both be at the 10th Anniversary Ride at Bobbington in May riding Major’s machines and hope to have the opportunity to learn more and to raise a glass to him at the Royal Oak, Halfpenny Green lunch stop. James’s ride though is disguised as one of Crown Cycles of Kingstanding’s racing team machines but there is no doubt who built it. On the site soon! I have particularly enjoyed identifying a frame built, it seems, for Ant Taylor in his All Rounder winning year and living in excellent hands now. I am waiting to see the extent of the fall out in terms of information that emanates from checking a frame number and hopefully will learn more at the ride. The Riders Room is showing great promise. Thanks to Felix whose exploits seeded the idea with me and for Terry Harradine for the first contribution. We offered to host Alvin’s Major goodies and so there are now things to spend money on and we hope it goes well. Finally for the nerds among us I have plundered the idea of a ‘parts box’ from the wonderful Flying Scot website and will be beginning to put this together over the next few months. See you on the 10th May. We have posted over 10% of the known MN frames thanks to friends and we have a few more to come. Soon though we will run out and will need your help. If you have a MN and would consider taking and sending us photos (including the frame number) we can add it to the site. If you are able to provide us with a description of frame size, components and finish details we can also send directly to Alvin Smith so that your machine is recorded for posterity. Please do get in touch. 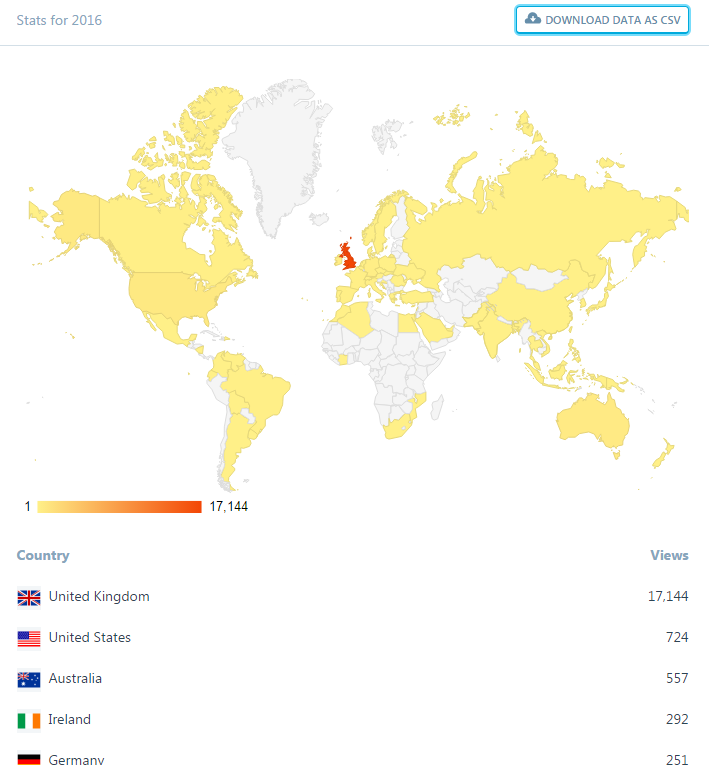 The website has received over 1200 views in the first few weeks with visitors mainly in the UK but also the USA, Australia, the Netherlands, Belgium and even the Philippines! A couple of changes you may have noticed. We have added categories to The Gallery and when we have got as many frames on there as we think possible we may rearrange them in date order. A new page has been created called The Riders Room. Our first contribution has been gratefully received from Terry Harradine. If you ever rode a MN competively, for pleasure or took it touring round the world we would love to be able to share your stories and memories. We are happy to edit your offerings if required, just please send them in. Welcome to our launch and first editorial. This page will be updated from time to time when new machines and offerings arrive to add or talk about. So please revisit and help us to make a useful contribution to our cycling social history. There are three bikes to start the gallery. All have history and stories attached, all have been refinished, but for me the original finish can be so evocative and speaks volumes for the age and changing fashions. Please send us pictures of your own machines. These can be just the frame and forks or the complete machine, ideally both sides. Details of the frame especially the seat cluster, head tube, fork crown and bottom bracket underside would be welcomed. They have no need to be pristine or age correct as we appreciate the ravages of time on equipment, the need to replace parts and show a path through time. The machine can say everything we enjoy about its past. There is one which explains this very well that will be posted shortly. Alvin has been very busy. He has given me a list of extant bikes that have been recorded and verified and advises that presently there are 106 in total. He is doing some analysis of the results. Can I repeat, please, please, send us your photos for our reference gallery which will emerge as we develop this site. Condition is quite immaterial. 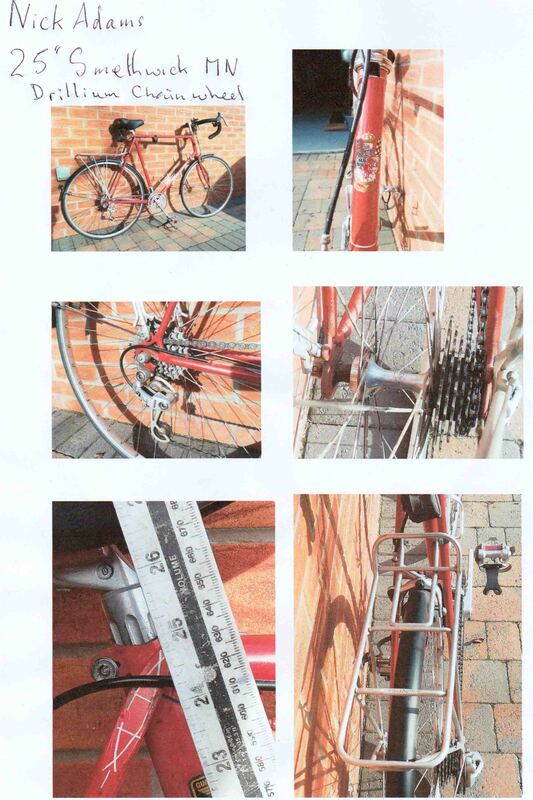 The bottom bracket photo will only be used for Alvin’s verification process unless consent is offered or from open source material. You can communicate in privacy and be assured the knowledge will stay with the team, if you are concerned or secretive like some owners I know! We will never reveal any other details without consent. Don’t forget this is still Major’s centenary year and do come and meet us at the 10th Annual Major Nichols Memorial Ride on 10th May at Wolverhampton Halfpenny Green Airport. Details will follow. 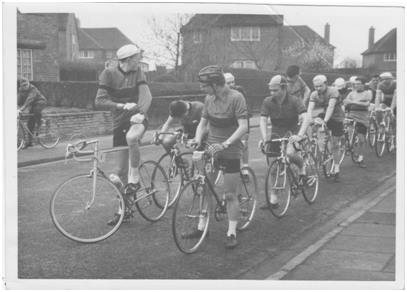 This is an extract from a photo at the starting line up at the Hill Top CC Junior 30 mile road race about 1960 which was 3 laps of the High Bridges Course. Here is the whole photo with at least 2 and probably 3 MN machines in full view. The wheels in front were my friend Dennis Troman, also on a MN and the then junior captain Alan Lloyd waiting to lead us out. He was on a Rotrax I think and went on to far greater things in his career. I am the one with the semi-crew haircut, Les Flavell (behind), was the club’s junior joker. I can’t remember the name of the lad in the middle. Any help out there? Photo courtesy of the late Hill Top CC Secretary, Bill Skidmore. Bless him! The lad in the middle of the photo is the late David (Dave) Reynolds (my father). He rode Major Nichols bikes until the day he died, indeed my mother still has a mint condition example in her garage! Hi Alan, Just looking at your cover graphic and recognise the lad in the middle as my father David Reynolds. My mum confirmed that he raced for Hill Top. Unfortunately he is not with us anymore as he passed away in a car accident in 1994. I still have his old Major Nichols which was my reason for visiting the site. The frame number is MN 69 111 finished in bright red, which suggests that it isn’t the bike in the photo but a later 1969 purchase. 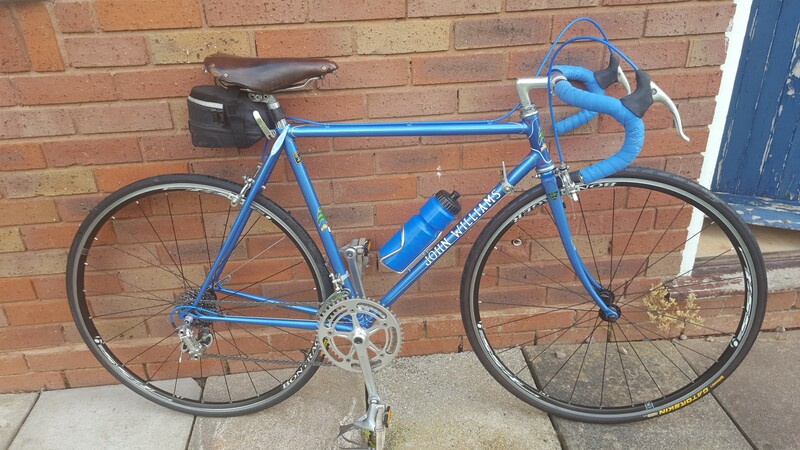 I’m pretty sure that it was resprayed by MN in the 1980’s (Smethwick front transfer) to co-inside with my brother and I getting into cycling with Walsall Roads. By this time my dad had developed a good beer belly and he had it in his head that he would start to do a few Sunday club runs to fight the flab! Now at 42 i’m the one with the beer belly and I need to get out on my bikes more so will be very keen to do the MN ride next year especially as its close to where I live in Walsall.